Our Crochet Lace Corner Handkerchief is 100% Cotton and measures approx 12″ square. 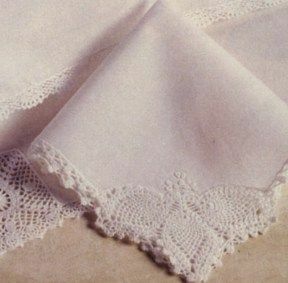 This handkerchief has a delicate Hand Crocheted Lace Design in one corner and a fine hand crocheted edging all the way around. Some people have described the corner design as an Angel. This handkerchief makes a wonderful gift as is or add a monogram or floral design to your handkerchief for a more personalized gift!